This is not Hermanus Bird Club news, but a project each and everyone of us can contribute to. Davide Gaglio writes “The Swift Tern Team is glad to share some very interesting insights on this species with you. In the last months juvenile ringed Swift Terns (from Robben Island) have been found nearby Swakopmund and Sandwich Harbour (Namibia) and Bird Island in Algoa Bay (Eastern Cape) showing a dispersal pattern following two directions (North and East). We also have been re-sighting ringed adult breeders in Robben Island this year, finding several ages in the colony from 4 to 20 years old and we found an adult ringed in 1979 in Marcus Island making the maximum longevity know of 34 years. Swift Terns are still around and with the nice weather coming up, we really hope we are going to get further information on this wonderful species. If that does not exhaust you, please join us for a drive to Gabriëlskloof winery, where we will walk around the farm a bit, but most of the birding will be done from the car. You will also be invited for a cup of tea in their restaurant. This happens on Thursday, 3 October, meeting at the Onrus Trading Post at 08:00. The outing will be led by Lee Burman, so if the weather looks dodgy on the morning, please phone her on 028 312 3011 or 082 829 5876. Our evening meeting is on Wednesday 16th at 19:00 when Gavin & Cynthia Turner will present ‘Spitsbergen and it’s Wildlife”. Their presentations are always top class, so don’t miss this one. To end off a busy October, 21 members are going on an outing with a difference to Die Hel and Wilderness. If you missed this one, keep your computer switched on and look out for a possible outing during November. The herd of wild, or feral horses that roam the marshlands at the Bot River lagoon area are believed to be South Africa’s only herd of wild horses in a wetland habitat. 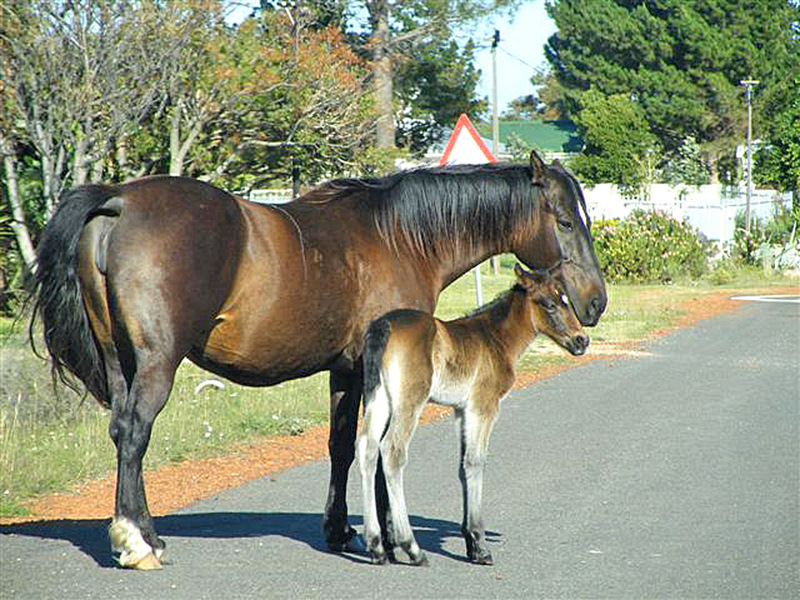 Recently they’ve been seen in Fisherhaven and reports of a young foal has been doing the rounds. When Lee Burman was atlassing the Fisherhaven pentad this week, she was lucky enough to come across the mom and foal and sent me this photo. I know it’s not bird related, but it’s still a special sighting in our area. Thanks Lee! Geoff Finney made an astounding regional discovery when he found and photographed a BUSH BLACKCAP at Harold Porter Botanical Gardens in Betty’s Bay at around midday today. The bird was near the entrance to Disa Kloof and was apparently quite vocal for the whole time that he was there. This represents the first record for the Western Cape and no doubt will get a number of provincial listers out there tomorrow morning to look for it. What a bird for the province – well done Geoff! Good luck if you are planning on going for it! Winter is over, there are signs of Spring arriving, the first feathered & human swallows, our local Sandpiper at Prawn Flats and other migrants are arriving home and our activities are increasing. Time to get out there and do some birding, which you can do by joining us on Thursday 5th for a walk around the Beaumont’s farm in Bot Rivier. We meet at the Onrus Trading Post at 08:00 to consolidate transport. Bring along a mid-morning snack to enjoy in the gardens and some insect repellent to ward off all the ‘goggas’ that have already hatched. Afterwards you can enjoy a free wine tasting at the Beaumont Cellar. Monday 16 – Wednesday 18 a group of 20 members visiting Bontebok Park. If you are campers and would like to join us, contact Craig Holmes. At our evening meeting on Wednesday 18th our speaker Alouise Lynch, Operations Manager at Dyer Island Conservation Trust, will tell us more about “Birds on the Edge of Extinction”. The meeting starts at 19:00 and visitors are welcome. The Fernkloof Flower Festival runs from 26 to 29 September and HBC will have a stall in the marquee where we will promote birding, help people with identification and have our Birds of Walker Bay booklets and DVDs for sale. Tell your friends and visit us please. October is an even busier month for birders with more swallows arriving, our morning walk at Gabriëlskloof, Stanford’s Bird Fair, Cape Bird Club’s Save our Seabirds Festival, the Turner’s evening presentation on Spitsbergen and an exciting away outing to Die Hel & Wilderness. Diarise Thursday 5th December for our annual End-of-Year function.